It is not rare in standardbred racing that girls take on the boys in overnight races, meeting the conditions set and many times beating the boys with no particular hoorah. But only once in a blue moon, so to speak, do we find a situation when female stars meet male celebrities in major stakes events. The July 4th holiday weekend for harness fans presents a battle of the sexes that many have yearned to see, no less wager upon. Bee A Magician, 2013 Horse of the Year, will meet Royalty For Life, 2013’s Hambletonian winner, and four-year-old other males in the debut of the Hambletonian Maturity. Adding to the thrills of those two stars in the same field is the fact that the race is 1 1/8 miles. That’s July 5, on a program that also features two elims that decide the field of next week’s Meadowlands Pace and one elim for the Mistletoe Shalee. There are also Friday and Saturday New Jersey Sires Stakes (NJSS) at the Meadowlands for freshmen of both gaits and sexes. Pennsylvania All Stars at Pocono on July 5 feature soph miles for August classic campaiginers. See the analysis on our sister blog, the Hambletonian Trail. Don’t miss our exclusive coverage; click the link after you read this. 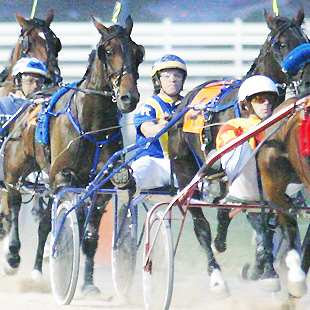 Weekdays are harness plentiful, too, check out the TwinSpires-Hoosier perks for players. Tuesdays, wager all you want and earn 10 TSC Elite Points per dollar bet. Click here for details. Every Thursday night, there is a 20-percent bonus on hitting the Pick 4 starting at Race 3. Click here for details. And the ongoing 10-percent Pick-4 bonus every racing night on Pick-4 hits continues through the meet. Click here for details. Follow @FrankCotolo and @TwinSpires on Twitter to get any and all late-breaking information on racing events and betting challenges that transpire between the publications of the two TwinSpires harness racing blogs. We have been justly critical of Bee A Magician in these blogs after supporting her at two and early at three when she paid decently. But she won all 17 of her starts at three against the same group of fillies and her connections declined a shot at the boys in the Hambletonian. At four, we predicted she would have some problems facing older mares and we were right, cashing in on D’orsay at more than 50-1 against her in an Armbro Flight elim. Then, in the final, she finished ninth. It was her first off-the-board finish since going off stride in her second start at two in July 2012. Trainer Nifty Norman said “Bee” scoped sick following that race. Now she has won a qualifier and she will face the boys, including the colt she would have battled when he won the 2013 Hambletonian, Royalty For Life. In the $484,850 Hambletonian Maturity at the Meadowlands on July 5, “Royalty” makes his four-year-old debut. The event will be raced at 1 1/8-miles. Your So Vain returns to race at four and was last alive during a heat of the Kentucky Futurity at three, so his current shape is in question. Sweet Justice doesn’t not belong in this group. Bambino Glide needs a lucky trip, having too much speed to win as he has over cheaper stock. Fico was improving last year en route to the Hambo but never quite lived up to the class of his division. Wheeling N Dealin, of course, was the disappointment of the division, as he came into his soph season the early choice to win the Hambo and could barely work up enough talent to get into it. If he is to do better at four, this is the spot to make his mark; he certainly has the style for the extra distance involved. Creatine is a classy sort and may be the key to an upset. He developed into quite a colt in the last half of the season (our TwinSpires Players Pool hit him at 5-1 in a Hambo elim) and, of course, he won the Futurity. This year he cannot be faulted for his races against Sebastian K and the crowd will offer him as a huge overlay considering his class and the fact that no one wants to wager on his driver, Mike Lachance, any longer. We will be happy to support him here as our outside contender. Two $50,000 Meadowlands Pace elims adorn the July 5 program and even though the first $1-million harness race has lost some of its financial punch, this is a major event and the major glamour boys are here to get a berth in the final. In the first elim we all know the damage that JK Endofanera can do since surprising many (not us, we supported him as a major overlay) in the North America Cup, so don’t expect 12-1 this time around. His prime contenders, however, may squeeze some valuable odds out of this affair. Doo Wop Hanover didn’t make the “Hempt” final but, as we documented here, he would be all over the consolation field at Pocono and he trounced them at 5-2, well worth the backing). He looms dangerous to “JK” here and may wind up the overlay. Lyonssomewhere was burned out early in the “Cup” and primed since then after a brief rest and a good qualifier. He may still be a top contender in this division for Jimmy Takter and he may offer better odds than he did in the Cup, as well as he may ration his wicked speed to work better for him in New Jersey. In the second split there should be no dominating factor in the wagering, since a few of these pace on equal terms thus far this season. There seem to be groups of fans for He’s Watching, Tellitlikeitis, Luck Be Withyou and Let’s Drink On It and no doubt each will make themselves heard in the win pool. But the outside contender Jet Airway doesn’t have a fan club and that will send him off with huge odds. Against this ilk in a Cup elim, he was 16-1 and flying, finishing fourth and missing the draw for the extra colt in the final. He has a JK style about him and in this field he could provide the late charge needed to cool down the speed burners of the popular colts mentioned. He is gunning for the final, where he may not be the best, but for this money he may show ‘em just who is boss. The filly-equivalent to the Meadowlands Pace, the Mistletoe Shalee for soph filly pacers, has one elimination, with the top seven advancing. Receiving byes were Uffizi Hanover, Weeper and Rock N Roll Xample. Drawing the rail in this tough race is Sandbetweenurtoes, who made her debut at the Meadowlands back in May, a 1:50.4 off-the-pace effort with a :26 kicker. She draws the rail and comes in off of a 1:51.1 qualifier behind Shebestingin and might be ready to tackle the better company. Gallie Bythe Beach is also a threat, coming off of a terrible trip in the James Lynch Final last week. There, she parked through fast fractions and faltered upon three-quarters. She has some maturing to do, but if she’s the right price, she’s also worth an investment. The green brigade takes to the Meadowlands oval for the second time this season in New Jersey Sires Stakes (NJSS) beginning Friday, July 4, with a division each for the frosh colts and fillies. First, however, a simple $15,000 two-year-old frosh colt trot for the greenest of green guys opens the Friday card with three coupled entries and a mile’s worth of speculation about wagering. Although the cast has already raced, none of the events are official, though still calculatedly sound. As the public addresses those races in an ordinary manner, we will look for an outside contender that promises improvement by supporting Don’t Mind Me. Coming from a strong baby race win at Pocono and getting post 10 here, the Jim Rayner trainee is as blue-blooded as the rest here (Andover Hall) and is bound to be ignored by bettors. Driver Howard Parker is listed at press time and we like Howard as much as any driver here, though the Meadowlands public may not and that is a plus for us). Then the $40,500 NJSS leg for the colts gets rolling and we will take Muscle Blues right back after finishing fifth in a race totally dominated by French Laundry. That one was too much for all involved. Fillies are next for a $39,500 purse and again we support Southwind Cartier, who was a solid third at 50-1 last week. That proves all of our notions that ignoring connections, breeding and driver in the early frosh fights offers great value to those of us paying attention. This Chocolatier product, as we documented last week, has talent and will pay off when she is at her best (she paid $9.20 to show, folks). Stick with her. The opening NJSS colt division on Saturday features three colts making their debuts, with another five back from last week. Among the colts premiering is Badix Hanover, an Ake Svanstedt trainee. He qualified once, a 1:57.1 with a brush to command around three-eighths. With only one mile to his experience, Svanstedt appears confident in the colt’s ability to improve. The closing colt split features Dealt A Winner, who is the only one returning for round two that was victorious in round one. This episode also features colts debuting, one being Rock On The Hill. The Tony Alagna-trainee has two qualifiers under his belt, one a fourth-place effort in 1:57.2 and his latest a 1:56.3 effort on the lead. That effort was eye-catching, as his first outing was an off-the-pace performance. Consistently closing in :26 and change, he should be sharp enough to challenge Dealt A Winner. The lone race for the fillies is highlighted by Stacia Hanover, who effortlessly slingshot passed The Show Returns to win with a final quarter in :25.4. Since she drew the outside this week, now’s a good time to abuse the public’s interest. Finishing second to Cashaway in the other split last week, Ideal Nuggets might be the gal to defeat the likely favorite. In her debut, she made a move after the pacesetter approaching three-quarters and came a neck short of victory in 1:55. She responded well in her debut, which shows that her second start should be even better.